Kick, kick, kick, kick, kick! There you are baby! I guess a certain little someone sensed my impatience last week because the day I turned 20 weeks, I got a little kick. And then another. And another. With that in mind, we’ve started getting Little Man’s room ready for a new addition. (As we live in a two bedroom house, it is inevitable that this baby will eventually share Little Man’s room.) Last week, we sold the double-bed from the room and converted Little Man’s cot bed back to a cot. Actually we left one side off for now and dressed it up with cushions to make a “couch” – somewhere nice to snuggle and read. I’m assuming it will be almost a year before the new baby sleeps in the cot so it makes sense to use it for something else in the meantime. And then we made a big purchase – a new bed for Little Man. We went with a Thuka Midsleeper, and decorated it with pirate curtains underneath. There was such excitement about it when we picked it out in the shop that I expected it to be the same once it was set up at home. But it seems that too much change at once proved a bit scary. That and an unfortunate movie clip from Tangled that Little Man saw where the witch steals the baby and cuts the baby’s hair. The idea resonated with him for some reason and he was terrified that someone would steal him or his “new baby” or come along in the middle of the night and cut his hair. Nothing we said could convince him otherwise. 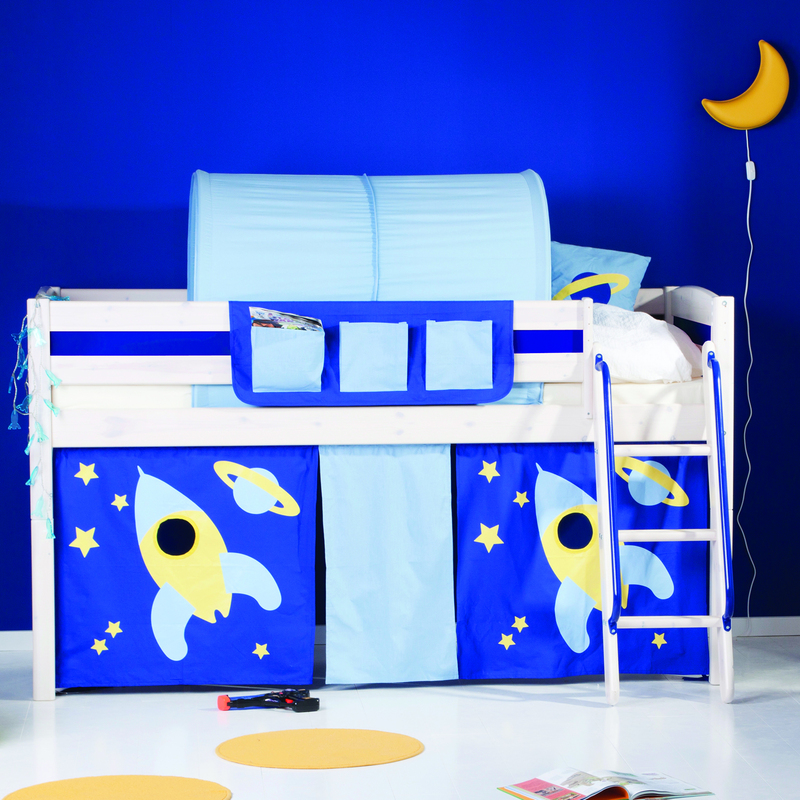 Thuka Midsleeper: Little Man’s is just like this, but in a pirate theme. I sought advice from the other Irish Parenting Bloggers and they had great suggestions. One I particularly liked was from Joanna from Musings of a Hostage Mother – she suggested filling a spray bottle with “magic water” and telling Little Man that if I sprayed it on his hair the magic would protect him. But when I suggested the magic spray to him, he looked at me (like I was an idiot!) and asked “Are you kidding?”, totally deadpan. This kid is too clever for me sometimes. Time to try another approach. I resorted to his love of all things Ben 10 and asked if he wanted to wear his Omnitrix watch to bed so he could turn into an alien if he needed to during the night. “That’s just pretend,” he informed me. Clearly the patronising was getting me nowhere. Yeah that makes me smile Julie. And he always calls it “my baby”!! I’m sure going to bed will become an adventure for him soon enough…. what a cool bed! He’s a lucky little man!! It is already Sinead. He likes to pretend he’s a pirate. And he tells me I’m a parrot. What I did to deserve that honor I don’t know! Aw! Lovely post! I’d sleep on that midsleeper myself….Or underneath in the camp! Underneath in the camp is much nicer. Dark and cosy! Lovely post Lisa. There’s nothing like those little kicks. Beds are a million times cooler now than when we were kids. Little Man is a lucky man – I would have loved that bed when I was young. What’s underneath? Glad all is going well with your pregnancy. Bed looks cool.